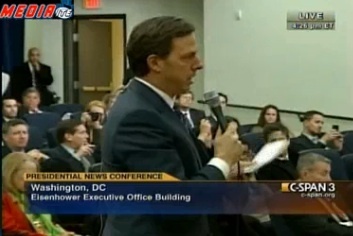 ABC News’ Jake Tapper To Obama: If Gays Can Die For Our Country Why Can’t They Marry? President Obama held a year-end press conference today, and some might have mistook it for a victory lap. The White House had reason to be happy given how they rebounded from a tough mid-term election to pass a lot of legislation during a lame-duck session. ABC News’ Jake Tapper focused on the passing of Don’t Ask Don’t Tell, but immediaitely tying it to the looming issue of gay marriage. Obama’s response seemed to keep open the possibility that the Administration’s position might in fact be evolving. Tapper broached the subject respectfully before adroitly asking “is it intellectually consistent to say that gays and Lesbians should be able to fight and die for this country, but they should not be able to marry the people they love?” President Obama revealed that his feelings about gay marriage are “constantly evolving” citing friends and colleagues of his who are gay and in lasting relationships. Even if the President were to shift positions to supporting the legalization of gay marriage, it is difficult to imagine it getting through a GOP controlled congress in the next two years.